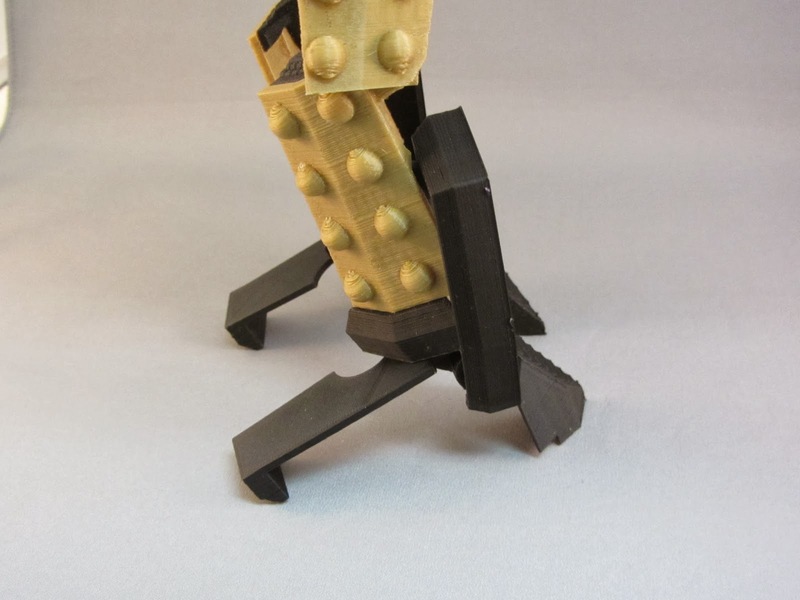 After the 3D-printed Transforming Tardis I designed, the next most requested design was for a transforming Dalek. This was to be a much more complex design - both because of the more geometrically complex nature of the Dalek compared to the Tardis, and because I wanted to be a bit more ambitious with the complexity of the transformation geometry. 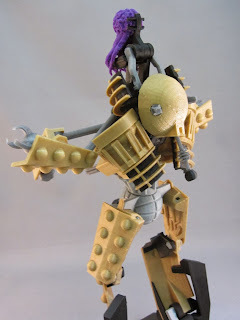 Unlike the Tardis transfomer, which was strongly modeled on the classic Optimus Prime design for the robot mode, my goal for this design was not so much to make a Transformer with a Dalek altmode, as to make a Dalek with the very unusual feature of being able to turn into a large humanoid-ish robot. As such it isn't based on any actual Transformer, although I did draw some inspiration from Octus, a Generation One transformer that apparently had a Dalek as its alternate form. I decided early on that I wanted the robot mode to still be recognizably Dalek in design, including having the actual Kaled mutant for a head rather than a recognizable Decepticon face, but I did take from Octus the idea of having the model have more than two arms. 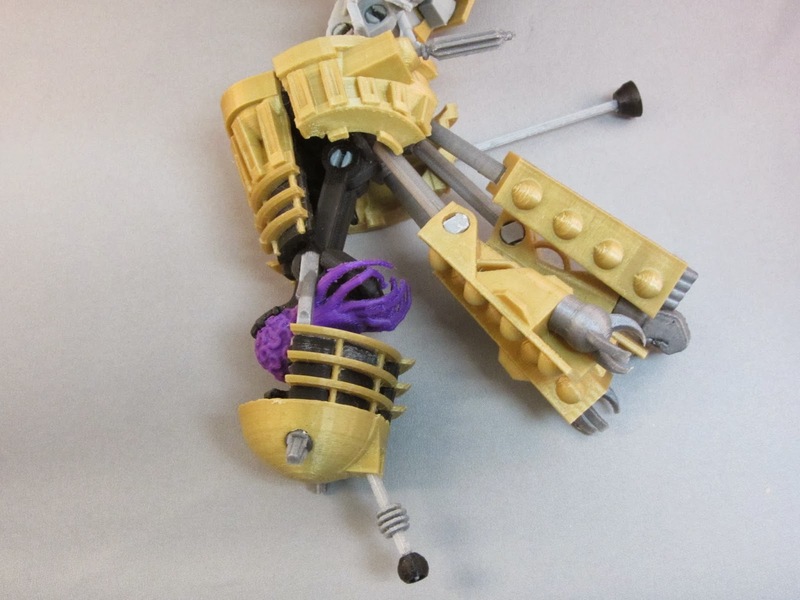 Originally I wanted to give it six full arms, but was only able to make the geometry work with four proper arms and two vestigial ones holding the Dalek gun and plunger. 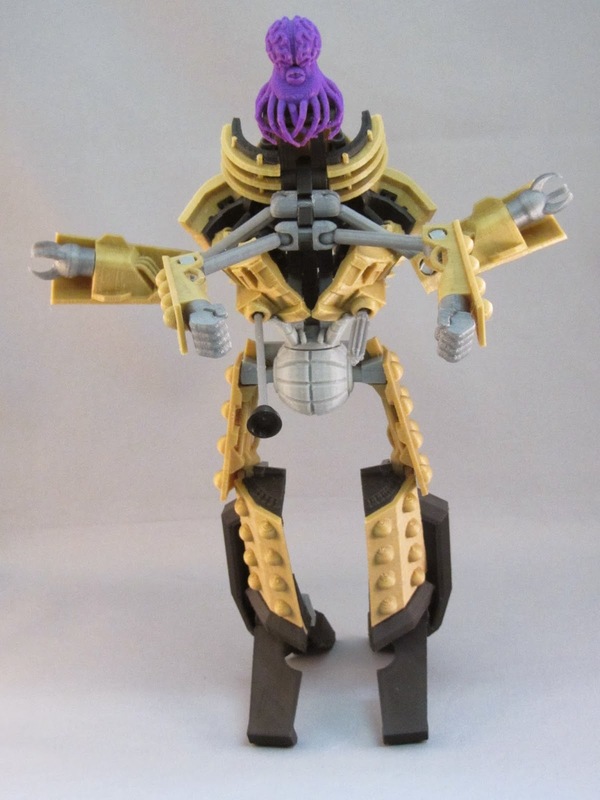 The robot mode actually ended up being more similar to the Transformers Animated Octus, although this was not at all intentional. 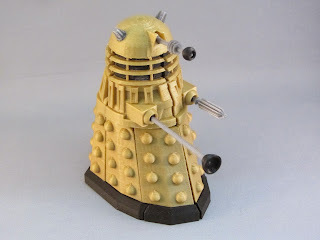 My main art reference for the model was the 2005 Doctor Who episode Dalek. This episode was the first in the new series to show the new-series Daleks, and really gave a good look at them. 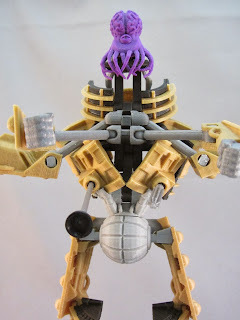 I liked the fact that most of the exterior details were the same color as the basic shell, which would simplify printing as I wouldn't have to make those bits separate parts. 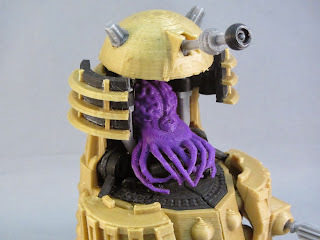 That episode also had a remarkable scene in which the Dalek's casing split open to reveal the Kaled mutant inside, and I decided early on that I wanted my model to be able to do the same thing. I used pictures of this amazing sculpture as an art reference for detailing the inside of the Dalek. Purple is about the closest color I had on hand. I also tried green and grey, but this seems to come out the best. The Mutant itself was one of the most complex individual parts I've ever drawn. AutoCad is not terribly good for drawing this kind of three-dimensional, organic shape, but after much effort I manged to make it acceptably well. I may redraw it from scratch in ZBrush in the future. 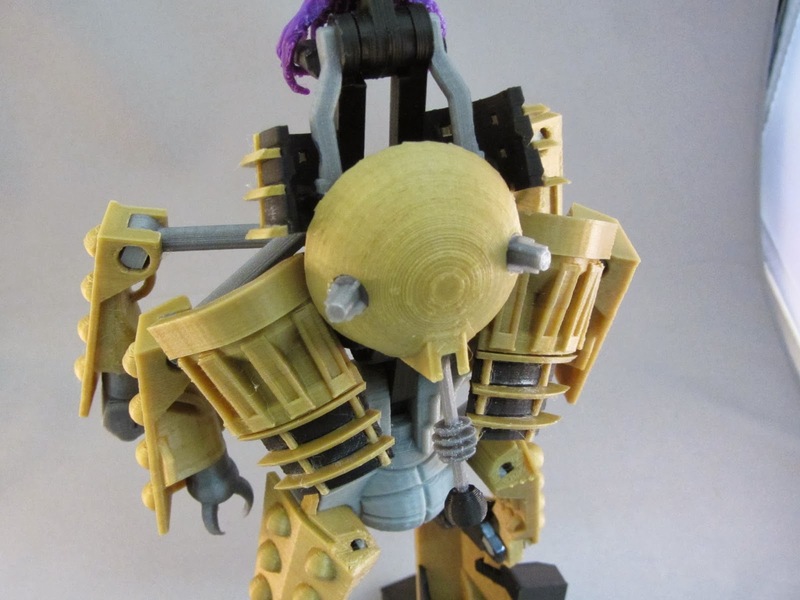 Designing this feature into my model meant that the upper body had to be essentially hollow, made up of movable cosmetic panels that weren't able to do much more than hold the shape of the upper body when in Dalek mode. 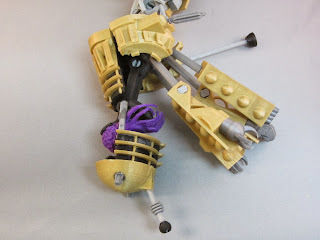 The bulk of the robot mode - the arms, legs, and most of the torso - all needed to be folded into the skirt of the Dalek, which ended up as a tricky engineering challenge. Then the arms can swing forward and straighten out. Two of the arms have fists (actually just copied-and-pasted from the Tardis transformer) while two have more traditional Dalek claws. 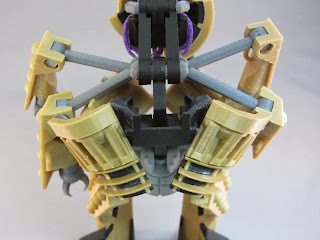 Elaborate locking tabs on the feet, knees, and hip joints allow the robot mode to stand upright on its own, not even relying on friction to hold upright. I learned from the mistakes of the Tardis transformer. Having the Kaled Mutant taking up most of the available space in the upper body also meant that there was no room for a proper robot head, but that was fine with me. I was inspired by the mad human-hybrid Dalek Sec from the episode Daleks in Manhatten. I thought that was a terrible episode, but I did think the form of a human with a Kaled mutant for its head was visually interesting, so I decided to make that part of my model swing up to form the robot-mode head. The torso unfolds, straightening up with a fairly tricky 4-bar linkage, and the mutant on its pedestal swings up out of the main body. The two front quarter-panels, holding the plunger arm and gun, swing down and lock to the abdomen parts. This hold the entire torso upright, and was a really complex bit of geometry to figure out. Then the rear quarter-panels swing down and tuck in behind the torso, clearing out the space behind the head. Finally the dome turns around to point backwards, then folds down on its support arms and locks in between the folded quarter-panels. 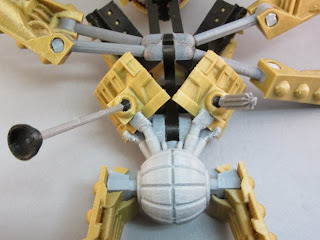 The dome support arms also carry the front grill panels, and these fit in to fill out the area between the head and torso. When completely transformed, it stands about twice as tall as when in Dalek mode. As with my Tardis transformer, it's bigger on the inside than on the outside. When designing the robot altmode, I wanted to keep aspects of Dalek design philosophy in mind. First, Daleks were intentionally designed to be menacing and inhuman, lacking in familiar and relatable details. 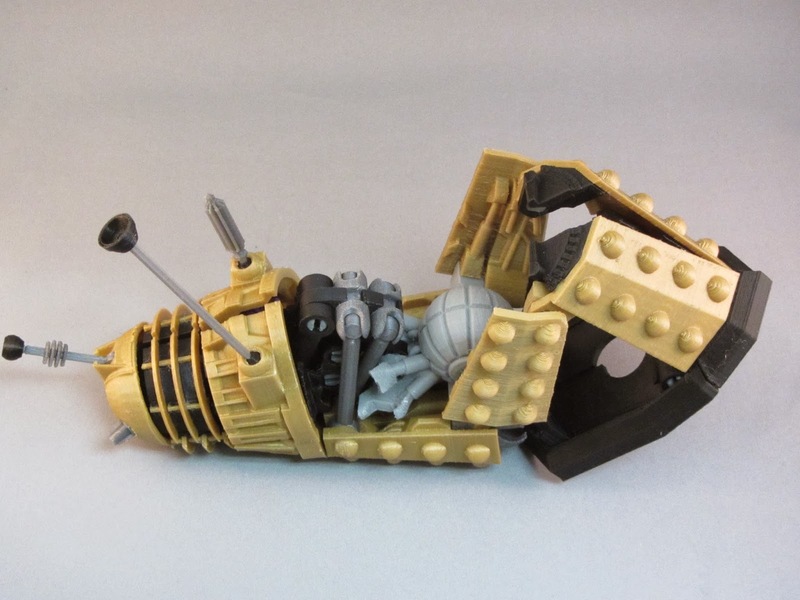 I wanted to keep that feeling even when the Dalek was transformed. While it might have arms, legs, and a head, it should still be inhuman and menacing in form. 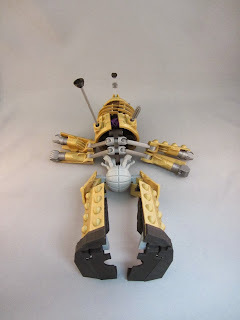 I tried to evoke an insectile, claw-like shape for the legs, and make the connection between the arms and the torso more similar to how the forelimbs of a grasshopper or similar insect are connected. Secondly, the Daleks, by their own admission, have no concept of elegance. Dalek machinery looks functional and brutal, with no care given towards appearance. Parts are never streamlined or carefully matched, and exposed pipes and hanging wires are common. This actually meant more work for me, adding those details to exposed surfaces throughout the model. I think the overall theme of ugly yet brutally functional worked out well. The finished model has just over 10 ounces of plastic, and I estimate takes at least 24 hours of machine time to print. (Total design time for me was at least 4 weeks of weekends and evenings, and a large number of scrap parts getting the design right through trial and error). There are about 100 printed parts in the finished design. It's not as clean a print as the Tardis transformer was. There are several parts that need to be glued together, as I wasn't able to make everything snap-fit. On the other hand, there are still no metal screws or other non-plastic parts involved, and no painting other than a single dot with a black Sharpie to make the pupil of the mutant's eye. There are also quite a few small, fragile details that are tricky to assemble properly, and the transformation sequence is difficult. 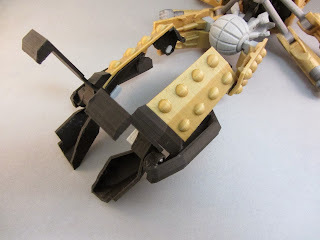 The torso is made up of a lot of parts that want to flop around loose until you lock them together, and when going back into Dalek mode it's tricky to get all the body panels in place. There are a few bits of geometry I still could touch up to make everything go back together more easily. I will probably be posting build files and assembly instructions for this on Thingiverse, once I've cleaned up a few details and had a chance to put together a good assembly guide. This design was mostly a learnign experience for me, as I gained a lot more experience on designing complex 3D assemblies with Autocad. Autocad really isn't the best tool for this, I was really running into the limitations of the software on this project, so I'm hoping to gain more experience with ZBrush and Solidworks for future projects. 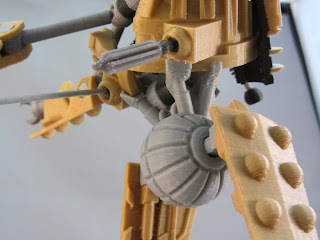 Great job...put this up on 3dhacker! Please do post this! Great work. Working on it. I want to get a good assembly guide put together first, since there are some really tricky steps in putting this one together. It's not as simple and snap-together as the Tardis was. I need to make an entire second one, and take pictures of every assembly step. Should be up later this week. This is an awesome design! 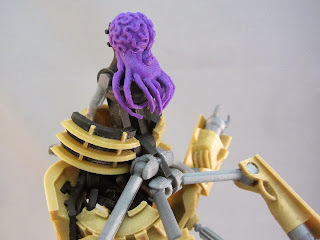 I started to print with my Form 1 but ran out of resin, but I did get the mutant and he is fantastic! I'll have to paint mine as all my parts will be either red or clear but I can't wait to finish, thanks so much for sharing this!